Based on the seasonal rhythms and festivals of the ancient year, "The Wildwood Tarot" draws its inspiration from pre-Celtic mythology and shamanic mysteries, placing mystical archetypes into a nature-based system rich in shamanic wisdom and forest lore. The archetypal forces of the deck act as both guides and interpreters, taking us on a spiritual, mystical and psychological journey deep into the labyrinth of primal Earth mysteries. To walk among the age-old trees of the wildwood is to journey back in time. 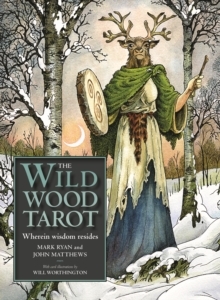 In this eye-catching deck, previously known as "The Greenwood Tarot", Mark Ryan and John Matthews reawaken the classic forest archetypes of the Green Man and Woman, the Archer, the Hooded Man and the Blasted Oak. Will Worthington's rich and vivid images bring this ancient world back to life and make it possible to feel the magic and power of the wildwood. The 160-page book comes with a 78 beautifully illustrated tarot cards.